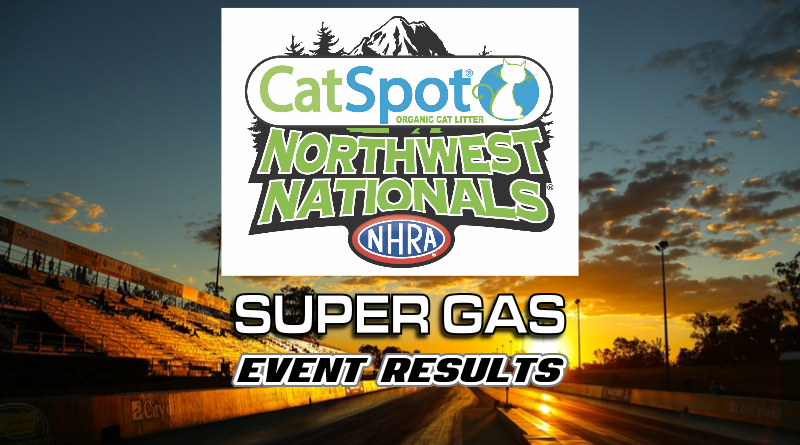 KENT, Wash. – Gene Kelly collected the Super Gas Wally at the CatSpot NHRA Northwest Nationals held recently at Pacific Raceways. In the final Kelly, from Grand Ronde, Oregon, defeated current top 20 ranked Robert Naber of Ontario, Calif. The win was Kelly’s first in his second national event final round appearance. Kelly averaged a .023 reaction time in eliminations with his best light, a .005, coming in round three. With the exception of round four where he was setup .05 fast, Kelly typically setup around a 9.88 and drove the stripe. Excluding his semifinal bye run, the final was the only round Kelly reached the finish line first. Kelly won the first four rounds via his opponent’s break-out. Kelly began eliminations with a tough draw in the first round as he paired with super-class hitter Ryan Herem. Kelly’s holeshot (.021 to .040) forced Herem, who was holding .06, into a break-out 9.874 as Kelly fed him .011 at the stripe. Kelly scrubbed a couple of hundredths to go dead-on 9.904 for the win. In round two, Brent McKinney had a killer .006 light against Kelly’s .014 but he broke out -.016 when he grabbed .034 at the stripe. Kelly once again scrubbed a couple hundredths to go 9.910 for the win. Kelly’s lucky break came against third round opponent Curt Geise. Kelly took a .005 to a .025 holeshot and although he looked to be setup dead-on the index, Kelly gave up the stripe killing .04 to go 9.945. Luckily, Geise didn’t pick up Kelly’s dump in time as he took .031 to go -.006 under the index. Kelly was second off the line against fourth round opponent Rodney Souza which made his finish line decision a little easier as both driver’s were setup well under the index. Souza, set up on a 9.83, took .025 stripe to go under the index by -.025 while Kelly climbed on the brakes once again killing .03 to go 9.877 for the double break-out win. The win against Souza gave Kelly a bye to his second national event final round. Waiting for him in the final was the previous week’s Super Comp winner at the Toyota Sonoma Nationals, Robert Naber. Naber started his back-to-back run with a break-out win over Michael Dalrymple in round one. Dalrymple took .007 stripe to go -.004 under the index. Naber dropped a couple at the top end to go 9.913 for the win. After round two opponent Dan Davis red-lighted, Naber took and easy win in round three when Ross Childers missed the tree and ran over the index allowing Naber’s 9.970 to take the win. Naber met up with last year’s number 2 ranked driver Chris Cannon in the fourth round. After a dead even .024 start for both racer’s, the finish line got interesting as Cannon, who was holding a ton in eliminations (like a tenth), was setup around a low 9.80 and Naber was on a 9.87 himself. Cannon ultimately took .021 stripe to go 9.851 while Naber’s 9.872 was closer to the index for the double break-out win. In the semifinals, Naber took on current number 5 in the world, Casey Plaizier. After an even start, Plaizier dive bombed Kelly at the finish, feeding him .052 stripe. While Plaizer killed .07 to go 9.953, Naber grabbed just enough brake pedal to kill .03 to go 9.903 for the win. Appearing in his second final round in two weeks and his 10th of his career, Naber was looking to go two-for-two. Kelly picked up an .011 to .019 advantage at the starting line and raced to the finish. With both driver’s holding .02, they both found the brake pedal at the stripe as both racer’s ran dead on the index. Kelly’s 9.909 reached the finish line .004 ahead of Naber’s 9.905 to collect the Super Gas Wally. Both driver’s drove a great race as it’s always cool to see a couple of .90’s on the board in the final. Congratulations to Gene Kelly on his first national event victory.